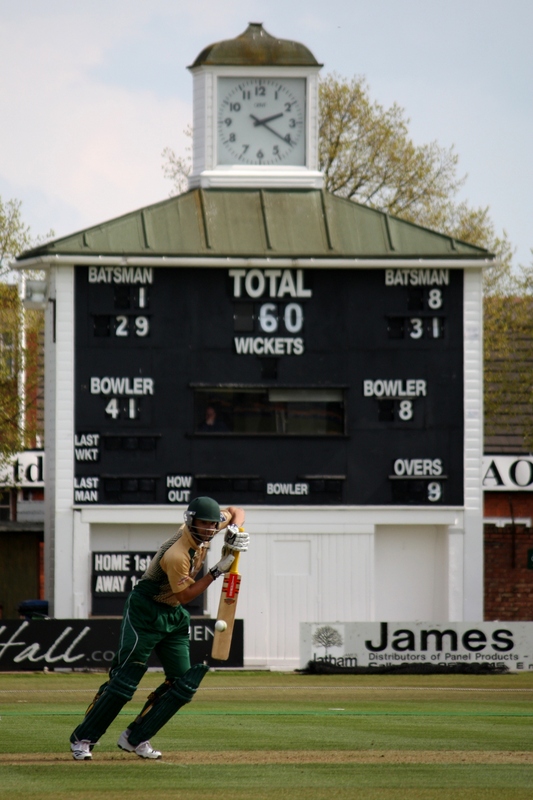 Leics win another game – Christ! Last week work-wise was a large steaming bowl of arse gravy. 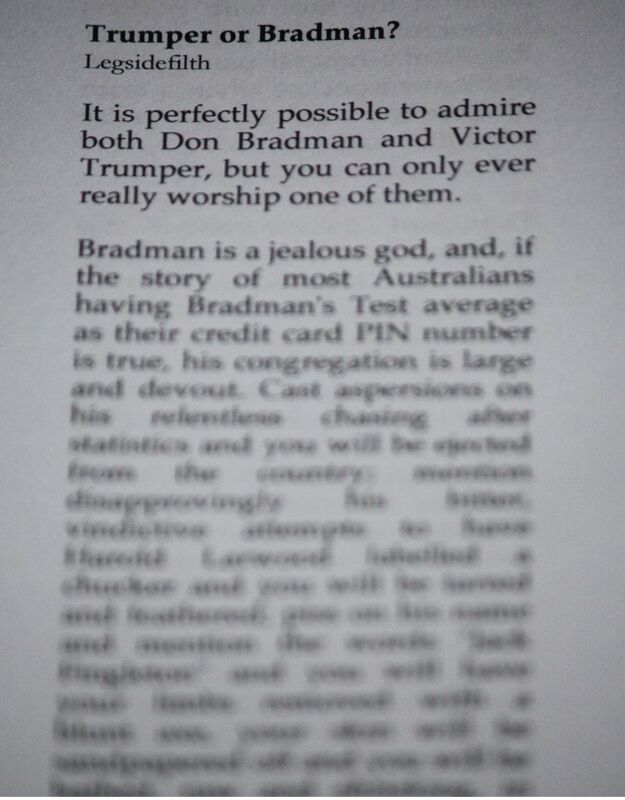 So the only antidote was to get myself down to Grace Road for the first Pro40, sorry, Clydesdale Bank 40 (jesus) match of the season, against Nottinghamshire. And Leicestershire won, by crikey. Again. I make that 3 wins since Matthew Hoggard assumed the captaincy crown. Not wasting any time settling in to the job, is he? Sunday was a rum old day as far as the weather went. I woke up at 5:30AM and it was hammering it down. Thankfully, the match wasn’t due to start till 1:45PM and for the rest of the day, bar the odd short shower (which fortunately didn’t interrupt play), we were spared by the weather gods, who, while making us aware of their presence, chose not to unleash the full extent of their wrath until after Leicestershire had wrapped up the victory and we’d made our way home. Jacques du Toit played a major part in giving Leics a total to defend, making 141 from 122 balls out of a total of 282-6, and Wayne White’s dream season continued with another personal milestone of a career-best 6-29. To be honest, seeing the way Amla and Hales opened Nottinghamshire’s innings, Leicestershire’s performance with the bat looked like it may have been found wanting. Amla’s placement and timing just made it all seem too easy – he really is a class act – and Alex Hales impressed with a confidence and maturity in aggressively going after the bowling. Hoggy, however, didn’t let the team’s morale falter, and after bringing on Claude Henderson the runs suddenly dried up and wickets started falling. 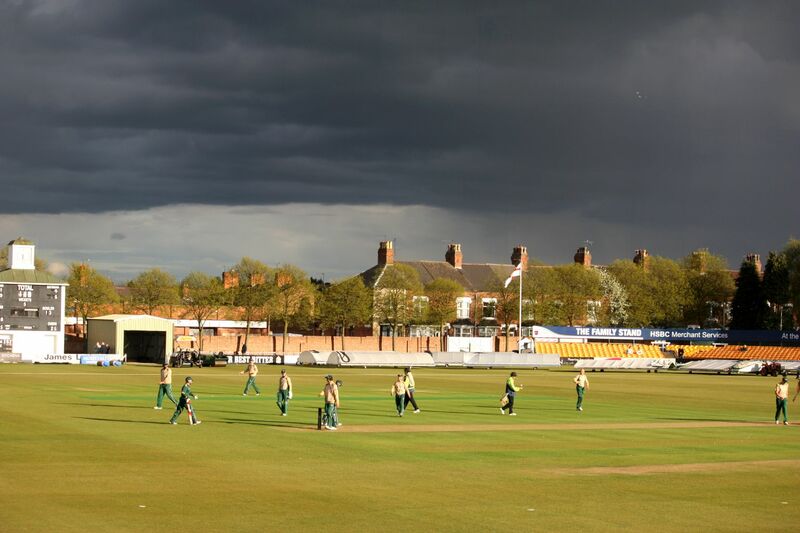 Hoggard removed Hales and Wagh in the space of two overs, and Henderson and Harris chipped in with a wicket apiece with Josh Cobb turning his arm over to tie them down from the Pavilion end. The match was arguably Chalky’s, though. Wayne White’s been having a barnstormer of a season so far; four of his wickets today came from 9 balls, and the atmosphere in the Meet, where I was sitting, was absolutely electric. 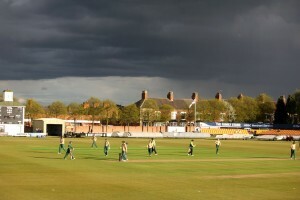 A glowering bank of black rainclouds heaving in over Grace Road did nothing to dispel the tension, and many necks were cricked craning to make out the total required by Duckworth Lewis on the scoreboard, but victory for the Foxes arrived before the rain did, and boy, did it feel good. It was a bit tough being a Leicestershire member last season. There was so much raw potential in the team, but the step from potential to performance a lot of the time seemed a leap too far. This year, the team seems to be playing with a sense of renewed purpose and enthusiasm, and I put this down, in large part, to the arrival of Matthew Hoggard. Thanks, Hoggy. Long may it continue. 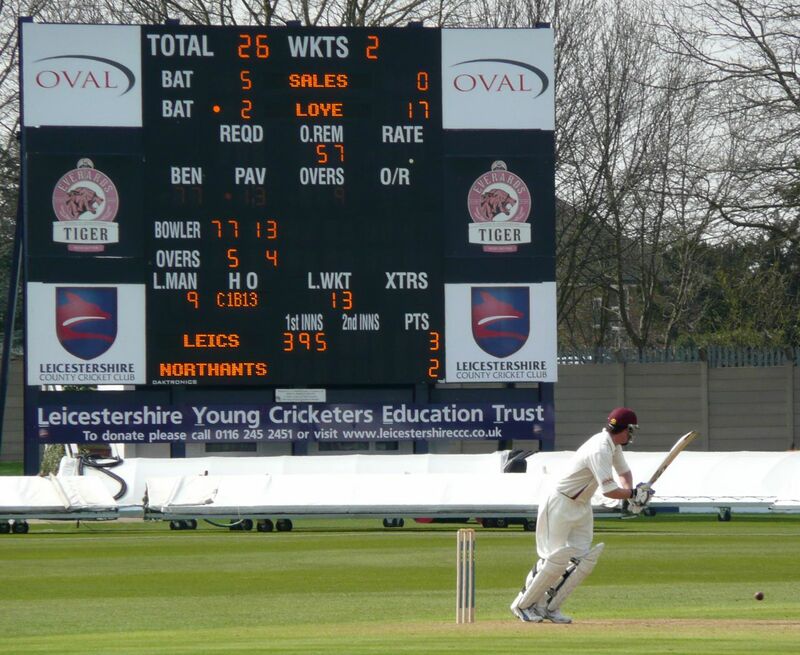 This weekend past was spent at Grace Road watching Leicestershire’s first game of the season against Northants. 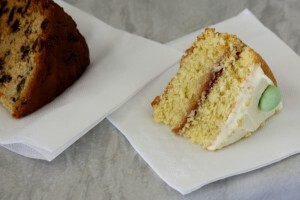 The weather – on Saturday, anyway – was pleasant, cake was consumed, and Leicestershire won. Everything had been given a new lick of paint; most of the members had survived the winter. The guy I sat beside tried to consume his own body weight in picnic food in the shortest time possible. I bought a couple of books from the bookstall, collected my yearbook from the office and bought my ticket for the Lions game taking place in July. Everything had a pleasant “first day back at school” feeling about it, and despite a dire last season in which Leicestershire finished bottom of the second division, there was a cautious mood of optimism in the air. New season, new captain, new sense of purpose. I missed James Taylor’s splendid innings of 88 on the first day, and the three wickets that fell during Leicestershire’s run-chase on the last, but I managed to watch everything else inbetween. Saturday was a great day for watching cricket. Leicestershire were already in a great position thanks to Taylor, ably assisted by gutsy knocks from Tom New, Matthew Boyce and Wayne White. AJ Harris chipped in with 20* in a useful partnership with White to take Leicestershire’s total to 395. It was a good total, but given the presence of Loye and Sales in the opposition batting lineup, I was fairly sure Northants would be able to match it. Wrong. 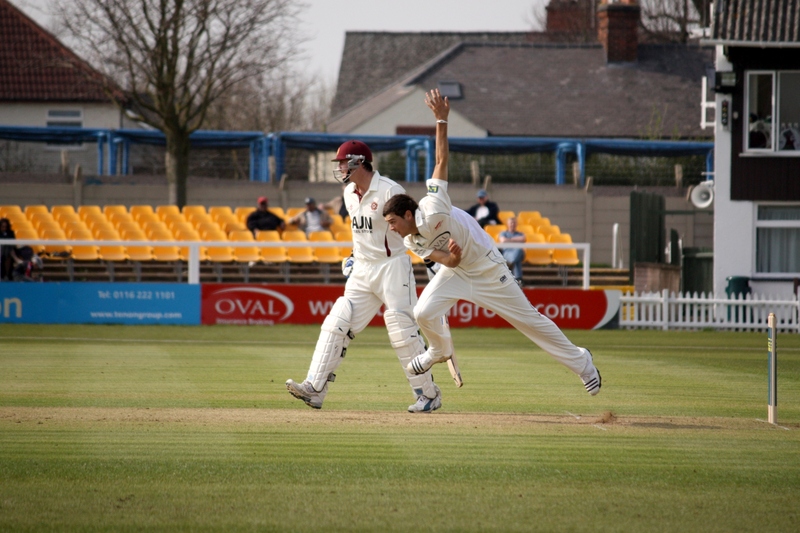 Harris dispensed of the openers early, and while Loye and Sales provided some dogged resistance – Loye in particular looked in good touch, and it was great to see him playing with something like his old confidence again – the decision of County’s new captain Hoggard to bowl Claude Henderson just before tea proved a masterstroke. 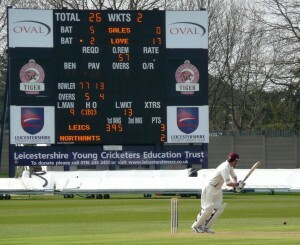 By the end of the day he had taken 6-19 and Northants were teetering on 179-9. His was the standout performance, but I was most impressed with Nathan Buck who bowled his heart out on Saturday for no reward. Steaming in with consistent aggression he saw a couple of inside edges go for boundaries – when it’s your day, it’s your day, and today was not Bucky’s day. Sunday was bloody cold compared to the blazing sunshine of Saturday. Hoggy sent Northants in again and they were bowled out for 269, leaving Leicestershire 65 to win. By stumps they had 14 of those 65 on the board with one wicket down, and on the last day went on to lose 3 more before Tom New and Josh Cobb saw them over the line. Harder work at the end than it should have been, but it was a win, and a good way to start the season. 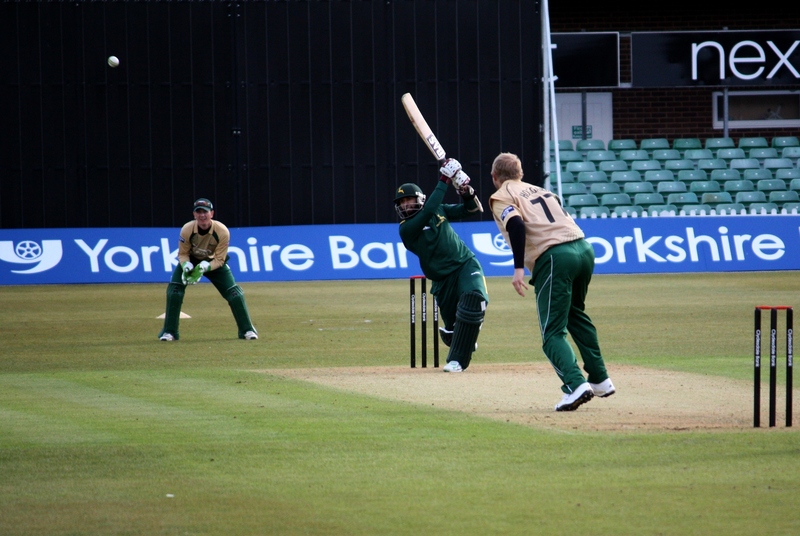 Next up, Derby on Thursday, and the stomping ground of Chris Rogers who put Surrey to the sword at the Oval. Hoggard and his young team have momentum, and it should be a tasty encounter. 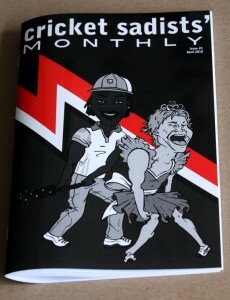 Cricket Sadists’ Monthly issue 1, available now. 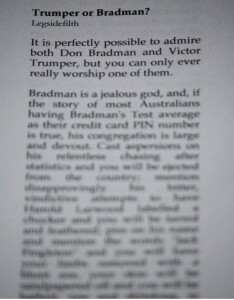 Featuring an article on Trumper and Bradman by yours truly.